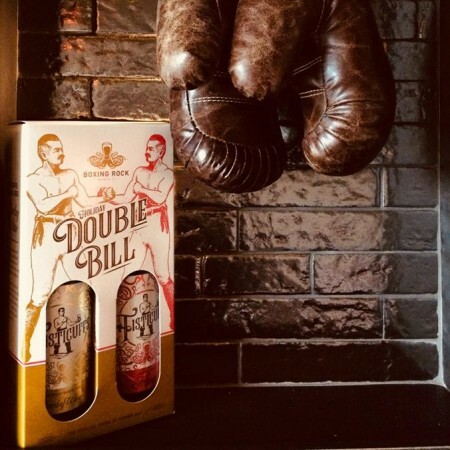 SHELBURNE, NS – Boxing Rock Brewing has announced the release of two new beers in its Fisticuffs Series of barrel-aged strong ales. Chardonnay Barrel Aged Barley Wine began life as an English Barleywine, before spending several months in an oak Chardonnay wine barrel, enhancing the malt character with notes of dark fruits like plum, prune, and fig, with hints of vanilla. Post-barrel-aging hopping increases the light fruit notes, which finishes with a soft carbonation. Barrel Aged Tripel is a classic Tripel (think light-coloured malt with Noble hops and a fairly clean Belgian yeast) that spent 8 months in oak, bringing out bread and biscuit flavours to play off of the lightly bitter and spicy base beer, as well as more dried stone fruit. The paired package of both beers is available now at the Shelburne and Halifax locations of Boxing Rock while supplies last.